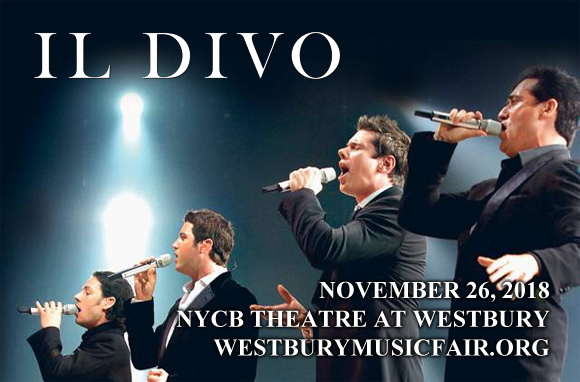 Il Divo are back, and they're headed to NYCB Theatre at Westbury on Monday 26th November 2018! One of the most successful classical-crossover groups in the world, the vocal quartet has made its name as an incredible live act that showcases just how powerful raw vocal talent can be! The group is currently celebrating both its 15th anniversary and the release of its most recent album, Timeless, which features "a classic mix of favorite pop and traditional standards in four languages"! The choice of songs, which includes "Hola" – a Spanish-language version of Adele's "Hello" – represent pieces of music that Il Divo believe to be timeless; a fitting offering from a group that is celebrating 15 years in the industry! “I am very proud of this record and we cannot wait to bring it to life on stage and we hope that everyone who comes to our shows has as much fun experiencing songs from TIMELESS as we had recording them in the studio,” says Il Divo member Sebastian Izambard. Multi-national classical crossover vocal group Il Divo began in the UK in 2003 and consists of singers Urs Bühler (Switzerland), Carlos Marín (Spain), David Miller (USA), and Sébastien Izambard (France). To date, the group has released 10 studio albums and two live albums, and has sold over 30 million copies of its albums worldwide, with 160 certified gold and platinum hits in 35 different countries. The group has received many awards and accolades over the years – the group was named "Artist of the Decade" at the 2011 Classic Brit Awards and in 2015 they received the Silver Clef Award from the Nordoff Robbins music therapy charity. In 2006, the group was named in the Guinness Book of World Records as the most commercially successful classical-crossover group in international music history. That same year, they also charted one of the best-selling music albums of all time, Siempre, selling five million copies in just one year. The group's most recent studio album, Timeless, was released in August 2018.